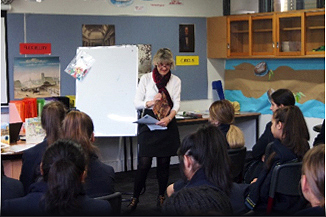 Well known Melbourne author Corinne Fenton spoke to Year 9 MacKillop this week as part of Synergy Book Club. As the students are about to embark on research for their own project on Melbourne, Corinne’s focus on how she conducts her research was very informative. I have always wanted to step inside the iron-lace gates of the Academy of Mary Immaculate in Fitzroy……Over the last 12 years or so I passed the Academy quite often while visiting Black Dog Books, for many years situated around the corner in Gertrude Street. Each time I passed I felt something drawing me in there – a story perhaps? So when I was asked to visit the school to talk about researching history in Melbourne for my picture books, I jumped at the chance – Corrine Fenton. Click here to the read Corinne’s post on her Academy experience.